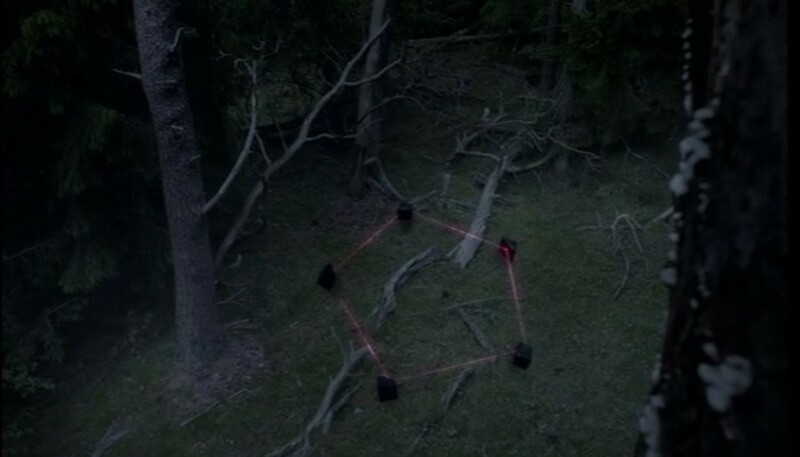 Danish video visionary Martin de Thurah has been directing machines in the forest for Mew's new video. Last time we spoke to Danish director Martin de Thurah, he had just finished creating a dreamlike vision for Fever Ray's "When I Grow Up" and now he has collaborated with fellow Danes, Mew for the second time, to realise another strange spectacle for their single 'Introducing Palace Players'. Using the Danish landscape to sublime effect, Thurah imagined that secret machines would move about mysteriously in the forest, combining basic geometry and wild nature. Cue cubes emitting lasers onto the trees and anonymous shapes sending out beams of light onto disused cars. We speak to Thurah about remote parts of Denmark and the beauty of snails sitting on black boxes. Dazed Digital: Where was it filmed? Martin de Thurah: In Denmark in different forests, one by the coast up north, one by a lake, one down a little path and then you have to jump across some water to get there and from a boat just before it gets dark. Me and Kasper in a little boat. On a gas station after hours with a dog. And some trees from Transylvania. DD: What's the idea behind the snails and hoisted objects in the woods? Martin de Thurah: Basic geometry and existing systems in the world meeting and communicating like they used to. Regrouping slowly into new shapes.The snails were in the forest, and I guess snails are attracted like us humans to black boxes on the forest floor. You just wanna climb up on it, and sit on it - and then it floats away - and its all very slow and nice. While sitting on the box you just let your mind flow. DD: How does it relate to the song? Martin de Thurah: In all ways, content, rhythm, sounds, mystery, colors, movement, funky stuff and a lot of love. DD: Were there any logistical difficulties? Martin de Thurah: There always are and that's the challenge of filmmaking - making plans, meeting somewhere at a precise time, not forgetting your notes, making sure everyone is happy and all that jazz. And when filming in the night in a forest it's nice to have a head-light on your forehead.